Can you REALLY make Classic Pulled Pork? The key to saving on cooking time may be cooking a big meal that can be converted into other meals throughout the week. It can be incredibly cost and time effective, but the initial prep isn’t always easy, and the prospect of roasting something all day can be a difficult event to squeeze into a busy schedule, but with a little creativity it is possible to do. 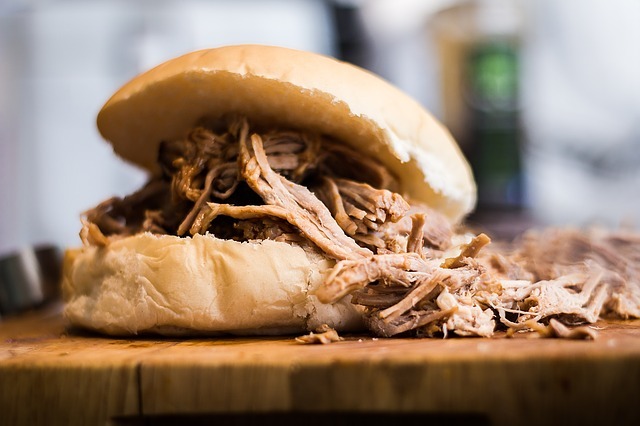 Pulled Pork is one of those wonderful meals that keeps on giving throughout the week. It’s an inexpensive cut of meat, and will deliver great flavor for many different meal ideas like Tacos or Taquitos or BBQ sandwiches. The first task is finding the time to prep the pork shoulder as it is usually brined in a salt rub for 24 to 72 hours. I find it best to aim for Sunday for the cooking day, so I start the brining on Thursday evening. For me, Sunday is an ideal day for the 6 hours of roasting. It’s a relaxing day around the house, and I have a ‘partner in crime’ to help out with the kids. The recipe by FOOD52 is tasty and fairly easy to pull off. Although, if your refrigerator is like mine, stuffed so tight you have a Jenga moment every time you get something out, leaving a uncovered pork shoulder in there isn’t possible. I just partially cover it, so as not to contaminate anything on the lowest shelf. The brine is very simple and can be altered to add other flavors. I have tried different herbs in the brine and before roasting: chili powder, cumin, garlic powder, chipotle, dried lavender, and sage. If you want to get really creative, you can throw some soaked applewood or juniper berries into the oven to give the pork a wonderful earthy flavor. Find your favorite flavors to make it a family favorite. Meals like this and baked chicken can give you many delicious meals throughout the week. Have other ideas for meals that can be extended throughout the week, let us know on the comments below. March 31, 2015 in Food, Main Page, Recipes.